After changing VisibleMaxDate the SelectedDate is no longer highlighted. 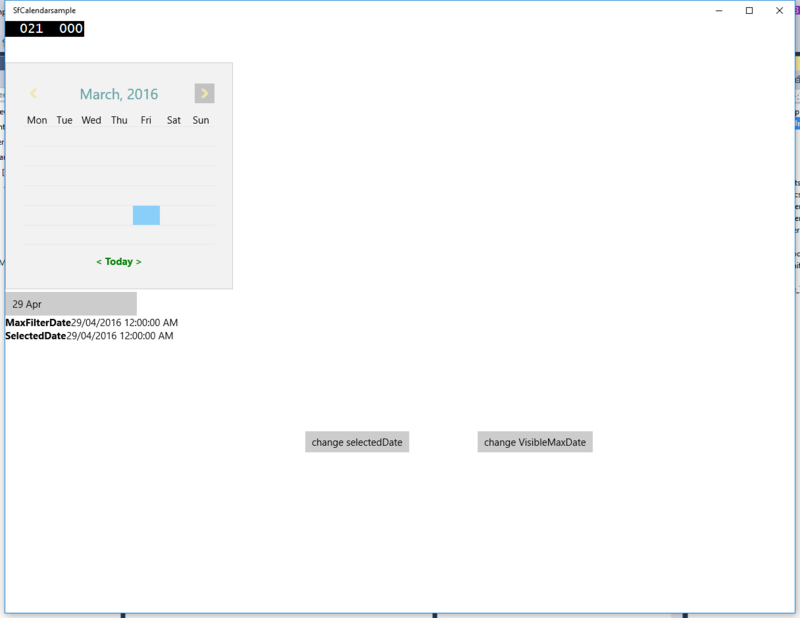 I don't know if it matters but the calendar is inside a closed flyout when VisibleMaxDate changes. We have analyzed the reported issue by creating a simple sample. But we were unable to reproduce the issue at our end. In this sample we have used SfCalendar and 'Change SelectedDate' button to set the SelectedDate value at run time and 'Change VisibleMaxDate' button to set the VisibleMaxDate value, the SelectedDate has been highlighted now also. Can you please check whether you are able to reproduce the reported issue with this sample? Could you please provide more details about your query by modifying the sample and replication steps to reproduce the issue? It will help us to proceed further. 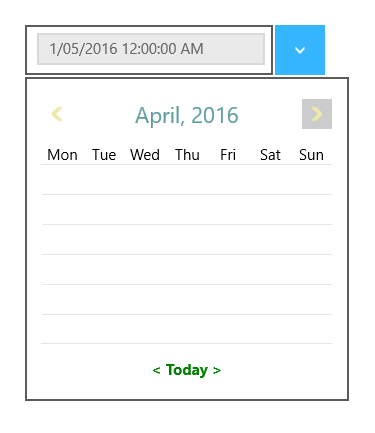 Increasing the VisibleMaxDate clears the selected cell from the calendar. We have confirmed the reported issue "After changing VisibleMaxDate the SelectedDate is no longer highlighted" as a defect. We will include this fix in our Vol 1, 2016 Service pack 1 release which will be available in April, 2016. We have modified your last updated sample to meet your requirement. 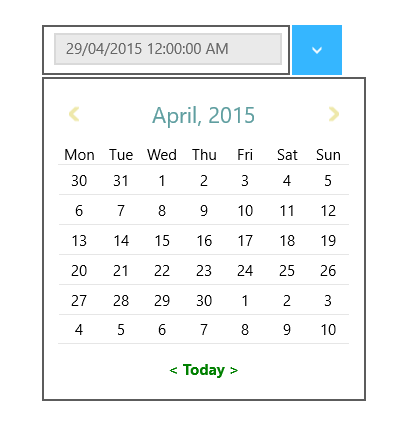 In this sample we have reset the SelectedDate property of SfCalendar in its loaded event. Because the reported issue occurs while changing the SelectedDate property of SfCalendar when it is in Unloaded state(Popup or flyout is in closed state). Please find the modified sample from the below location. Please let us know if the above sample meets your requirement or not. I don't urgently need it fixed. You're still fixing it in the next UWP controls release? I will wait until then. When we try to fix the reported issue in our source, we found that the issue is with the sample and we can fix this in sample level. Also this issue is not related with our source. Can you please check our last updated sample and update us whether it meets your requirement? I just recreated the issue in your sample. Also why are you giving me a sample where you are changing it how it works? In the app I am reusing the SfCalendar from multiple places which is why it is in a DataTemplate. And I am using it in a flyout which is why the example I gave you is in a flyout. If there is something wrong with my sample then fix it and leave the functionality unchanged or explain why it fundamentally doesn't work. Right now it is useless to me because you've changed it. What exactly was wrong with my sample? As far as I can tell the values set via databinding should flow through and it should just work. The changes you've made look like a hack fix. "Because the reported issue occurs while changing the SelectedDate property of SfCalendar when it is in Unloaded state(Popup or flyout is in closed state)." Isn't fixing that behavior the bug. Why doesn't SfCalendar handle the SelectedDate being changed while it isn't visible? I just reverse engineered your solution and it doesn't even work when the SelectedDate changes past the current month. So to sum up: SelectedDate still becomes unselected when VisibleMaxDate changes, and calendar rendering still breaks when SelectedDate is changed is changed while it is closed. These bugs in your controls are starting to waste a significant amount of my time. We try to convey the behavior of Popup, which doesn’t get refresh when its child is not in view. Due to this reason we have provided workaround sample to meet your requirement. On further analyzing on your update and the behavior of Popup, we have planned to refresh our SfCalendar, even it is not in view and make necessary changes in our source level, We will include this fix in our Vol 1, 2016 Service pack 1 release which will be available in end of April, 2016. Do you have a date for when the fix will be available? We are in the final phase of our release works and it will be available by this week. We are glad to announce that our Essential Studio Volume 1 Service Pack 1, 2016 (Version 14.1.0.46) is rolled out and is available for download under the following link.